– Onset of hypertension occurring in patients younger than 30 years without risk factors. – Abrupt onset of severe hypertension in patients older than 55 years. previously well-controlled essential hypertension as well as patients with known RAS. – Symptoms of atherosclerotic disease elsewhere in the presence of moderate-to-severe hypertension, particularly in patients older than 50 years. – Recurrent flash pulmonary edema in the setting of moderate-to-severe hypertension. Although hypertension is most often “essential” or idiopathic in origin, renovascular disease is an important and potentially remediable cause of both hypertension and progressive renal insufficiency. The coexistence of renal arterial vascular disease and hypertension defines this type of nonessential hypertension. Renal artery stenosis may be caused by a heterogeneous group of conditions, but > 90% of cases is accounted for by atherosclerotic renovascular disease or fibromuscular dysplasia of the renal artery. Takayasu’s arteritis is a less common cause. Thrombosis, embolism and dissection of the renal artery are rare causes(2). Ministry of Health and Family Welfare, Government of India has issued the Standard Treatment Guidelines for Renovascular Hypertension. 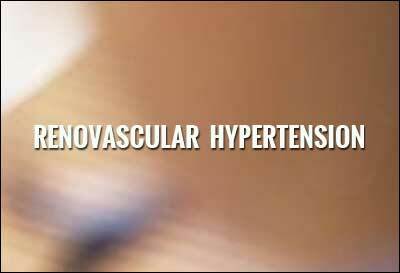 Renovascular hypertension (RVHT) is the hypertension secondary to renal artery stenosis. It denotes the causal relationship between anatomically evident arterial occlusive disease and elevated blood pressure. Hemodynamically significant RAS should be defined as either: 1) Severe (> 70%) angiographically confirmed stenosis, or 2) moderate (50–70%) stenoses as determined by angiography that are accompanied by hemodynamic evidence of renal ischemia documented by either a hyperemic systolic gradient > 20 mmHg, or renal fractional flow reserve of < 0.8. It is the most common type of secondary hypertension, accounting for 1-5% of cases in unselected populations and as many as 30% of cases in selected populations. The prevalence may be up to 60% in patients older than 70 years. In general, the prevalence of atherosclerotic RAS increases with age, particularly in patients with diabetes, aortoiliac occlusive disease, coronary artery disease or hypertension. Preventing atherosclerosis may prevent the development of rental artery stenosis. Lifestyle changes may reduce risk of high blood pressure. Cessation of smoking, maintenance of healthy weight, low cholesterol and lipid levels, regular exercise and diet with low protein, low sodium and high fiber content helps control blood pressure(3). Clinical presentation is protean. In addition to elevated systemic blood pressure, renovascular hypertension usually produces symptoms common to hypertensive states, such as headache, palpitations, tachycardia, anxiety, light-headedness, decreased tolerance of temperature extremes, retinopathy, and mental sluggishness. Significant complications include heart failure, myocardial infarction, stroke and, occasionally, renal failure. A high index of clinical suspicion may help in picking-up such patients. In particular, hypertensive patients with extensive atherosclerotic disease in other areas are prime candidates. Hypokalaemia, an abdominal bruit, the absence of a family history of essential hypertension, duration of hypertension of less than one year, and the onset of hypertension before the age of 50 years are suggestive. Investigations comprise tests to assess overall renal function, perfusion studies to assess differential renal blood flow, and imaging studies to identify renal artery stenosis. Imaging studies establish the diagnosis; assess the location and severity of the clinically suspected RAS. Hematological Studies – To assess overall renal function, blood urea, serum creatinine, creatinine clearance and e GFR studies are needed. Duplex renal artery sonography – following clinical and laboratory evaluation, Duplex Doppler Sonography is the first line of imaging. It helps direct visualization of the renal arteries with measurement of various hemodynamic changes in the main renal artery with Doppler, providing both structural and functional assessment of renovascular hypertension. Additional information regarding kidney size and presence of hydronephrosis can be obtained by ultrasound. Doppler for renal artery evaluation is limited by operator dependency, obesity and bowel gas artifacts. Captopril Scintigraphy adds valuable information regarding revascularization. The study relies on the effect of captopril,an angiotensin-converting enzyme inhibitor, to reduce glomerular fi ltration in an ischemic kidney and increase it in the contralateral normal kidney. This difference can be imaged under a gamma camera. Asymmetry of flow or unilateral delayed isotope appearance but good bilateral renal concentration and excretion are strongly suggestive of large renal artery vascular occlusive disease that might be cured by revascularization. Test results may be falsely negative in the presence of bilateral disease. Magnetic Resonance Angiography – Magnetic resonance angiography (MRA) is a noninvasive test for assessing renal artery stenosis, especially among patients with renal insufficiency at higher risk for contrast nephropathy. Evaluates not only the main renal arteries but also the accessory renal arteries and distal stenosis. The reliability of magnetic resonance angiography is not affected by the presence of bilateral renovascular disease unlike scintigraphy. MRA may overestimate the severity of stenosis relative to angiography. Computed Tomographic Angiography – CT angiography (CTA) especially with MDCT is a valuable noninvasive study for assessing renal artery stenosis. If the patient has normal renal function, this probably represents the best screening test. It is much faster to perform than MRA, is less prone to false positive results, and has superior spatial resolution. It is not limited by flow related artifacts and presence of mural calcification. Evaluates not only the main renal artery but also the accessory renal arteries and distal stenosis. Subset of patients not suitable for MRA can be evaluated by CTA. Digital Subtraction Angiography – remains the gold standard to determine the degree and location of renal artery stenosis. With the availability of noninvasive imaging, DSA is reserved to confirm the diagnosis, often as a prelude to percutaneous intervention. However, it is limited in providing information about the functional role and thus the clinical significance of the lesion. Use of Iodinated contrast and related nephropathy limit its use(4). Relative merits of the different types of treatment depend on a variety of factors such as the age of the patient, the etiology and severity of the renal artery stenosis, and the presence or absence of concomitant disease(3). Medical Management: ACE inhibitors are widely accepted as being superior to other antihypertensive drugs in controlling renovascular hypertension. Furthermore, ACE inhibitors have been associated with improved survival of these patients, many of whom carry a heavy burden of generalized atherosclerotic disease. 1) Poorly controlled hypertension on adequate medical therapy – with hemodynamically significant renal artery stenosis and accelerated hypertension, resistant hypertension, and malignant hypertension. 2) Ischemic nephropathy in a viable kidney with declining renal function – with renal artery stenosis and progressive chronic kidney disease with bilateral renal artery stenosis or a stenosis to a solitary functioning kidney. 3) Cardiac destabilization syndromes, i.e., flash pulmonary edema, recurrent congestive heart failure or refractory unstable angina – with hemodynamically significant renal artery stenosis (i.e,>70% stenosis on angiography) and recurrent, unexplained congestive heart failure or sudden, unexplained pulmonary edema. 1. Biochemical studies to assess overall renal function. 2. Imaging studies to identify renal artery stenosis and to assess the location and severity of the clinically suspected RAS. Duplex renal artery Sonography – First line of imaging following clinical and laboratory evaluation. It helps by direct visualization of the renal arteries with measurement of various hemodynamic changes in the main renal artery with Doppler, providing both a structural and a functional assessment. Once suspected, the patient can be referred to tertiary care center for further evaluation and management. Out Patient: Medical management for RVHT without complications can be done on an outpatient basis. Day Care: If patient is on maintenance hemodialysis, day care is needed. In Patient: To manage complications of RVHT such as heart failure, myocardial infarction,stroke and, occasionally, renal failure patients may require hospitalization. Poorly controlled hypertension on adequate medical therapy, Ischemic nephropathy in a viable kidney with declining renal function, Cardiac destabilization syndromes, i.e., flash pulmonary edema, recurrent congestive heart failure or refractory unstable angina are the indications for referring for further aggressive management. Situation 2: At Super Specialty Facility in Metro location where higher-end technology is available. Investigations:Required to establish the diagnosis, assess the location and severity of the clinically suspected RAS. Medical Management: ACE inhibitors are widely accepted as being superior to other antihypertensive drugs in controlling renovascular hypertension. Endovascular Management (Percutaneous Transluminal Renal Angioplasty & Stenting) – For patients with symptomatic, hemodynamically significant RAS, reperfusion by angioplasty and stent placement is the treatment of choice. Patients with significant RAS who have 1) poorly controlled hypertension despite adequate medical therapy, 2) Ischemic nephropathy in a viable kidney with declining renal function, 3) Cardiac destabilization syndromes, i.e., flash pulmonary edema, recurrent congestive heart failure or refractory unstable angina are the subset who will benefit from revascularization. In Patient: For revascularization procedures, such as Percutaneous Transluminal Renal Angioplasty & Stenting (PTRA), patient needs admission into the hospital for minimum three to four days. To manage complications of RVHT such as heart failure, myocardial infarction, stroke and occasionally, renal failure the duration of stay may be longer. Out Patient: Medical management is done on an outpatient basis. CTA=CT Angiography, MRA=MR Angiography, PTRA=Percutaneous Transluminal Renal Angioplasty, IR = Interventional Radiology, CT=Computed Tomography, MR=Magnetic Resonance Imaging. ANTI HYPERTENSIVE OF CHOICE IN CASES OF BILATERAL RENAL ARTERY STENOSIS ?